Review: Lenovo Yoga 300 Intel Celeron 11.6″ Convertible – practical portability from Lenovo | GEEK! It’s been a little while since I last wrote a review for a portable computer, so I thought I’d head back to my roots and see what’s new on the market at the moment. I managed to pick up this budget Lenovo Yoga 300 tablet online and I’ve put it through it’s paces. The Yoga line from Lenovo is nothing new. The concept is simple – any “Yoga” device has 360° hinges meaning that it is essentially a “convertible” and can theoretically be used as both a tablet and a conventional notebook computer. Yoga laptops from Lenovo have been around since 2012 and the release of Windows 10, but since then they have become more refined and have picked up several improvements. Inside the box you get the notebook itself, a 45W mains adapter and a small amount of paperwork. Unboxing the device and powering it up for the first time was fairly simple – except I found that I had to plug the unit in for the first time before it would boot (despite having almost a complete charge from the outset). Relatively promptly you’ll end up at the Windows 10 setup screen (Windows 10 now comes pre-installed on these devices, despite earlier versions being available with Windows 8.1). It’s the usual set of set up questions, with the exception of one additional step for Lenovo registration (which is optional). Once you’re done with that, the notebook will reboot and you’ll be ready to go fairly quickly. The notebook comes with a fair amount of additional pre-installed software, such as various Lenovo tools (handy but not strictly necessary) and a 30 day trial of McAfee LiveSafe which is OK but nowhere near as responsive as Norton Security or even Windows Defender (which is free and comes with Windows). The first thing I noticed with this notebook is the quality of the keyboard. Lenovo really seem to have a knack for putting together really decent keyboards with just the right level of typing feedback and the perfect level of movement, making lengthy periods of typing an absolute breeze. As I use a pretty wide variety of keyboards very frequently, it did take me a little while to pick up the position of prominent keys such as enter and shift, but this was a minor bugbear that’s very common with new devices. Sadly, the same really can’t be said for the touchpad. It still baffles me as to why manufacturers decided to remove the physical left and right mouse buttons and rely on either the tap-to-click function or, worse still, a designated area that is possible to tap but almost impossible to click and drag. Youch! It’s not unusable by any means – it’s just such a shame that manufacturers haven’t learnt this lesson. For simple navigating as a mouse pointer it’ll work without issue – it’s just so painful trying to move things with a finger and thumb! This technique only seems to work with Apple MacBooks – primarily because they have a large enough touchpad area to make the idea workable. For everything else – forget it! Thankfully, there are other areas where this device really shines. The overall build quality is very impressive and device feels really solid. The brushed black metal that lines the lid and chassis looks very professional – although it does show wrist marks a little more than I’d like. The touchscreen display also works impeccably, with very little delay and a high level of accuracy. Connectivity stands out on this device with a grand total of three USB ports (consisting of 2x USB 2.0 and 1x USB 3.0), a full size HDMI connector, a collapsible gigabit Ethernet port, a full size SD card reader and a 3.5mm headphone jack. For a device that is just 14mm thin from bottom to keyboard level, this is seriously impressive. Having the USB ports is eternally useful on these portable devices – especially as one of them is what Lenovo call an “always-on” USB port, which basically means it’ll charge devices such as your mobile phone even if the computer is completely switched off (essentially acting as a portable battery bank). Furthermore, the device comes with a very well designed reversible 45W power adapter, meaning that charging from flat to full only takes around two hours and is easy to connect in low light. These small things matter! File transfer speeds over the on-board wireless 802.11ac adapter were impressive. 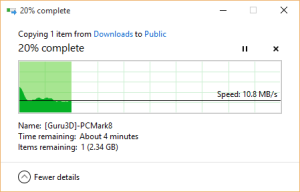 File transfer speeds over the on-board wireless 802.11ac adapter were impressive.In addition to physical connectivity, you also have very decent dual band wireless 802.11ac networking, which performs very well. When transferring a large file from my NAS to the device over around a 10m distance through two floor levels, I was still achieving in excess of 11MB/s (~85Mbit/s) which is perfectly adequate and on a par with my much more powerful MacBook Pro. The device will of course still pick up your older 802.11a/b/g/n networks too. 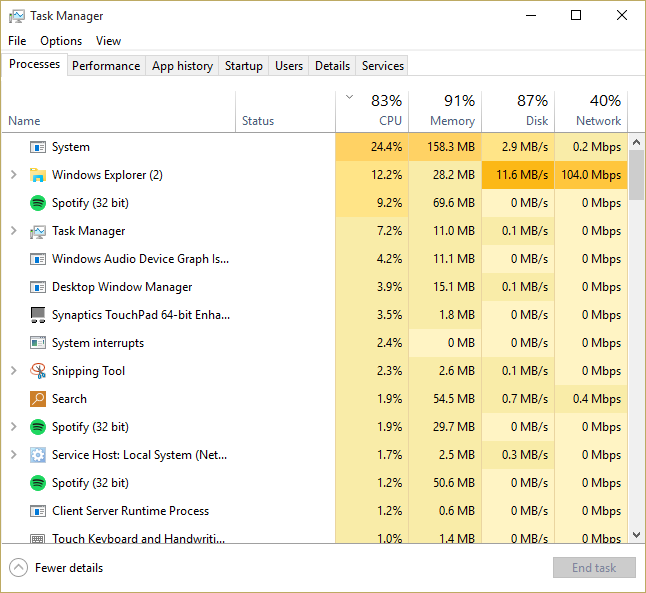 Running multiple applications ate up the RAM fairly quickly, but the device handled basic multitasking well. 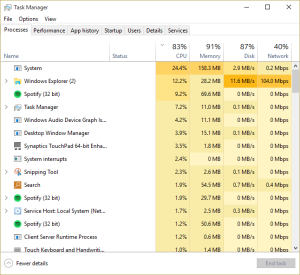 Running multiple applications ate up the RAM fairly quickly, but the device handled basic multitasking well.Actual performance from a benchmarking point of view is more or less par for the course given the specs of the device. With a 1.83Ghz Intel Celeron processor (with Turbo Boost up to 2.25Ghz) and 2GB of RAM, it’s no ground breaker. It’s perhaps a little more snappy than the similarly priced Linx 1010 tablet, but the Atom processor in the Linx is a fair bit more efficient in terms of power consumption and this shows in the around 4-5 hour battery life while in light use on the Lenovo. Nonetheless, most apps load very quickly and boot times are better than average for a device of this class. It’s a shame to see a 11.6″ device with only 2GB of RAM as this will hold you back if you want to run several applications at once, but there are more expensive models available with better specs. As would widely be expected most basic applications (such as Spotify, Microsoft Office and Google Chrome) will run simultaneously without too much trouble. Streaming 1080p video from YouTube was flawless (even though the device has a 720p display). There are a couple of other minor niggles that might irritate a few people. Unsurprisingly, the on-board speakers are weak and lack bass – I wouldn’t want to use them for any extended period of music playback. The keyboard, while very comfortable to use as aforementioned, lacks a couple of useful keys. There’s no skip forward and backward function keys, which meant I frequently had to stop what I was doing and pull up Spotify to skip between tracks. The bezel around the display is surprisingly large and leads me to wonder whether Lenovo would have been capable of providing a slightly larger screen area without having to increase the size of the device. Finally, there is a tiny of bit of play in the hinges on the device, so if you type quite heavily (like me) you might experience a teeny bit of screen wobble which, while not enough to annoy me, was a little too noticeable in some scenarios. Overall, it’s a very impressive device but just has a couple too many minor issues to warrant a five star review. Don’t get me wrong – sometimes I can be a little picky with these minor things, but that’s what reviews are for! It does what it’s designed to do and makes working in a small space very enjoyable – which is much more than can be said for some other devices in this class. Who would I recommend it to? Well, if you’re looking for something to type up reports on the go with or you feel the need to be connected to your emails and social media around the clock this is probably the perfect device for you. If you’re looking for a larger laptop replacement that’ll cope with more demanding tasks such as multimedia editing or gaming, look elsewhere as you’ll want something with more defined internal specifications. See also: Linx 1010 Review – best Windows 10 tablet on the market right now? This entry was posted in Product Reviews and tagged 300, convertible, ethernet, hdmi, lenovo, metal, review, tablet, usb 2, usb 3, windows 10, yoga on January 30, 2016 by GEEK!.